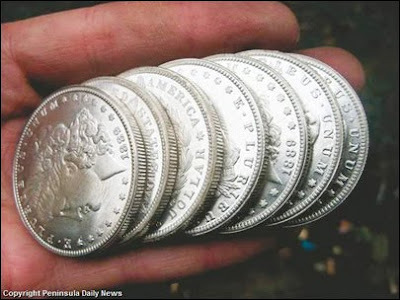 "US Morgan Silver dollars." Well they have a sense of humour or irony I guess. Just as a synopsis, the fake coins found thus far are old editions mostly from the 1800s. You can tell a fake by its lack of the distinctive 'ring' sound when dropped, or by attraction to a magnet. "Stacks of ingots, bars, all kinds of stuff - they make everything from pennies all the way up to silver dollars," says Port Angeles police officer Duane Benedict. "China is making these things by the thousands." I looked into this a while ago, and apparently due to the 'manufacturing' cost, faking silver coins is barely worth it, whereas bars in larger denominations are much more lucrative. So if they're faking silver coins too, it seems to me that plain profit is not the (only) motive. Clue: banksters have a lot of paper silver promises to cover. No tax on gold but tax on silver. So TPTB reeeeaaaallllyyy do you over when you are a poor man and buy silver in UKplc. Now that is a raketeering influenced and corrupt organisation. NOT A CONSPIRACY.